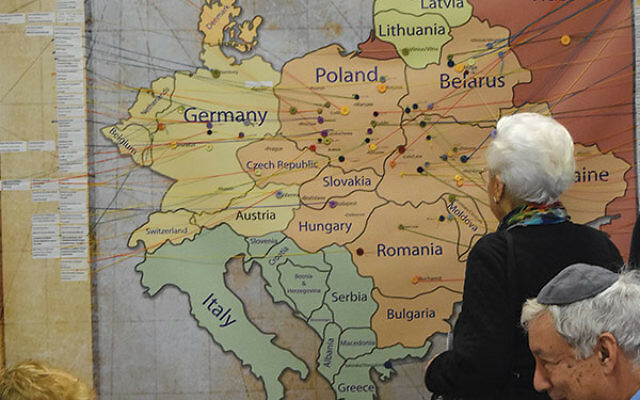 Mindy Beck helps Frank Felsenstein adopt an immigrant identity and Miriam Willinger looks up her ancestors on Adath Shalom Synagogue’s Roots Map, before entering the “Great Hall” of Ellis Island. Adath Shalom in Morris Plains recently held its “Coming to America” festival, an event planned in tribute to members’ immigrant ancestors. 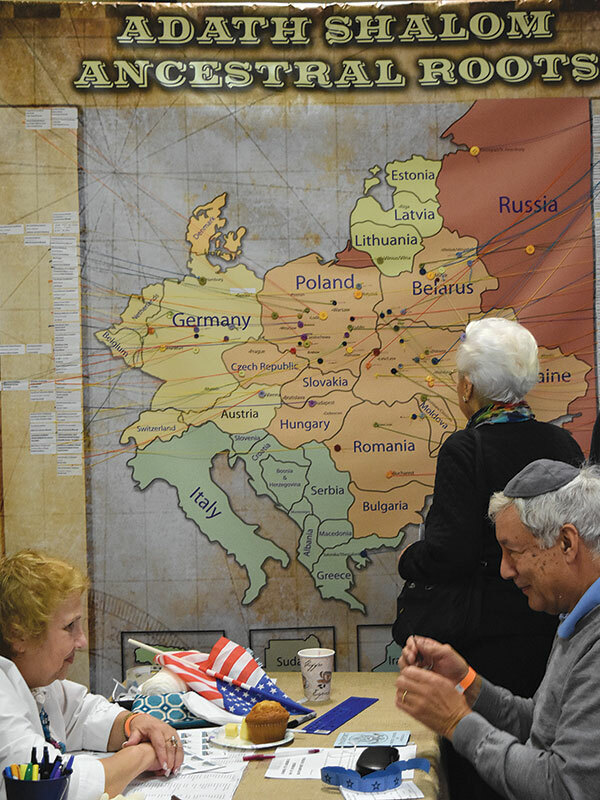 The culmination of a year of roots-related activities planned by the synagogue’s Lifelong Learning committee, the Oct. 16 event’s core experience was an interactive recreation of the Ellis Island screening process, completed by families and individuals assuming ancestral identities. It drew 266 participants from the Jewish community. Congregants further personalized the history lesson by sponsoring Photoshopped “storefronts” that recalled the shops and workplaces of their families’ first Americans. Labeled with their history, these were affixed to huge cardboard models of tenement buildings. The day also featured klezmer music, a family photo studio, crafts, kugel, pastrami, pickles, and a Yiddish flavor — songs, newspapers, and a rendition in mamaloshn of “God Bless America” by Cantor Lois Kittner. Over 65 volunteers participated, in roles ranging from carpenter to kugel maker to immigration official.